The ceremony was organised to recognise and reward employees for - successfully implementing innovative projects and submitting innovative suggestions. 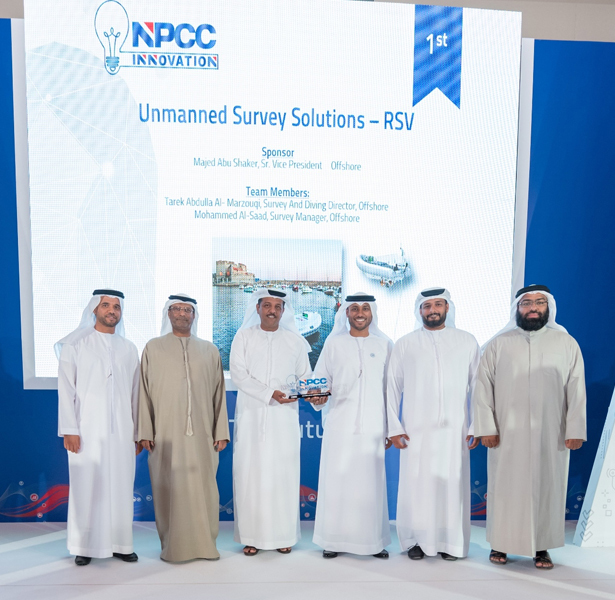 Some of the awarded innovative projects, called “Accomplished Innovations”, are exclusive to NPCC, and have never been executed by any other organization in the world, These “Accomplished Innovations” have saved NPCC over 200 Million Dirhams, and helped it become more efficient, productive, and cost-effective. One of the Accomplished Innovation Project has helped bring manufacturing expertise to the UAE. Project team designed a Cable Stabilization solution and worked with the vendor to set up a manufacturing facility in the UAE, creating in-country value. This innovative solution was “Designed by NPCC & Made in UAE”. Another example of Accomplished Innovation Project, and winner of the top award, is Remote Survey Vessel (RSV), which saw the creation of a Technology IP, a patent owned by NPCC, and the invention of a completely new product. This solution which has never been used elsewhere in the world, is currently used by NPCC in its operations. Eng. Ahmed Al Dhaheri, CEO of NPCC said “Thanks to our wise leadership, who have made Innovation an important part of UAE 2021 Vision, it will encourage Emiratis to innovate and create value. Innovation is important for any organisation as it encourages people to challenge status quo and create value by finding new ways of working. NPCC, a leading international EPC contractor, provides Engineering, Procurement, Construction, Installation and Commissioning services to Offshore and Onshore Oil & Gas sectors, and is headquartered in Abu Dhabi with offices around the region. It was founded in Abu Dhabi in 1973. SENAAT, representing the government of Abu Dhabi, owns 70% and Consolidated Contractors Company (CCC) owns 30%. It has over 1200 Engineers based in its Engineering Centres in Abu Dhabi, Mumbai, Hyderabad and La Ciotat, capable of providing a full range of engineering solutions across all disciplines. It owns a fleet of 22 offshore vessels equipped with modern facilities to support its offshore operations, which can operate in depths from 10 meters to 2000 meters, and has fabrication yard in Abu Dhabi covering an area of 1.3 million square meters.